Hamilton is located 12 miles southeast of Glasgow on the south bank of the River Clyde. It was named after the 1st Duke of Hamilton, whose family made their mark on the town with the construction of several notable landmarks, some of which are still standing today. Hamilton Palace, which was built in 1695, was deemed to be one of the grandest houses in Britain at the time and was said to be admired by Queen Victoria, but unfortunately it was demolished in 1927 and it is now home to the Hamilton Palace Sports Grounds. More can be learnt about the former Hamilton Palace at the Low Park Museum, and those with an interest in the history of the Hamilton family can take a guided tour of the Hamilton Mausoleum, which unlike their former dwelling, still remains intact. The Hamilton family’s legacy continues with Chatelherault Country House and Park, which was originally built in 1732 as a hunting lodge for the Duke. Today it is still fully accessible to the public, who can take a tour of the main house, followed by a stroll around the vast grounds and woodlands. It is also a great area for fishing, golf and range of other outdoor activities. The Hamilton family’s legacy isn’t the only thing that has stood the test of time in the local area. Hog roast cooking, a technique which dates back centuries, is still just as popular today as it would have been when Hamilton Palace was still being built. 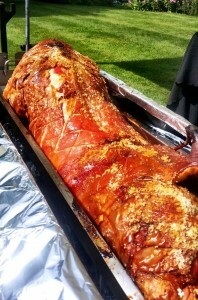 The Hog Roast Hamilton team may still use the same principles as our culinary ancestors to produce the most succulent meat possible, but our modern equipment and creative menus have elevated the humble hog roast to a level that rivals any fine dining restaurant. Our clients in the Hamilton area also love the flexibility we can offer when in comes to the location of their special occasions, as we can cook in any indoor venue or outdoor space. This allows you to be able to take advantage of the stunning woodland scenery and tranquil riverside spaces the surrounding area has to offer, which are such perfect locations to host parties and wedding receptions. With Hog Roast Hamilton at the helm, you will be guaranteed fantastic food that you can enjoy in any of these inspiring settings.